The U.S. Department of Agriculture announced Tuesday that farm operations in areas eligible for the Farm Service Agency emergency loans have until January 2019 to apply for loans to help cover losses related to the drought. Since April, La Plata County has been listed in an “exceptional drought” – the most intense category of drought according to the U.S. Drought Monitor. Nearly all of Colorado, with exception to the northeast corner of the state, is listed in some form of drought. The USDA designated seven counties as “primary natural disaster areas” because of drought: Alamosa, Archuleta, Conejos, Gunnison, Hinsdale, Mineral and Rio Grande. Eleven counties were not deemed natural disaster areas, but farm operations in these counties can apply for emergency assistance: Chaffee, Costilla, Delta, Huerfano, La Plata, Mesa, Montrose, Ouray, Pitkin, Saguache and San Juan. The news release said Rio Arriba, San Juan and Taos counties in New Mexico also qualify. It’s unclear why Dolores, Montezuma and San Miguel counties, which are also in the exceptional drought category, were not included on the list. Calls to USDA spokeswoman Latawnya Dia were not immediately returned Tuesday. The Farm Service Agency has other programs to help farmers recover from the impacts of drought, the news release said. Interested farmers and ranchers should call their local USDA office for further information. The disaster declaration covers Alamosa, Archuleta, Conejos, Gunnison Hinsdale, Mineral and Rio Grande counties. All but Gunnison County are served by the Upper Rio Grande River. Gunnison County is served by the Gunnison River. But the NRCS map shows pretty much all of southern Colorado is in bad shape because of drought. The USDA is also making disaster assistance available to farmers and ranchers in 11 counties contiguous to those in the declaration area: Chaffee, Costilla, Delta, Huerfano, La Plata (Durango), Mesa (Grand Junction), Montrose, Ouray, Pitkin (Aspen), Saguache and San Juan. The declaration means farmers and ranchers are eligible for emergency loans and other disaster assistance from the USDA’s Farm Service Agency. Those applying for emergency assistance have eight months from May 25, the date of the declaration, to apply for loans to cover actual losses. The USDA has other financial assistance available that does not require a disaster declaration, including emergency loans for livestock, honeybees and farm-raised fish; operating loans for farm ownership; and a tree assistance program. More information on those programs is available from the USDA. 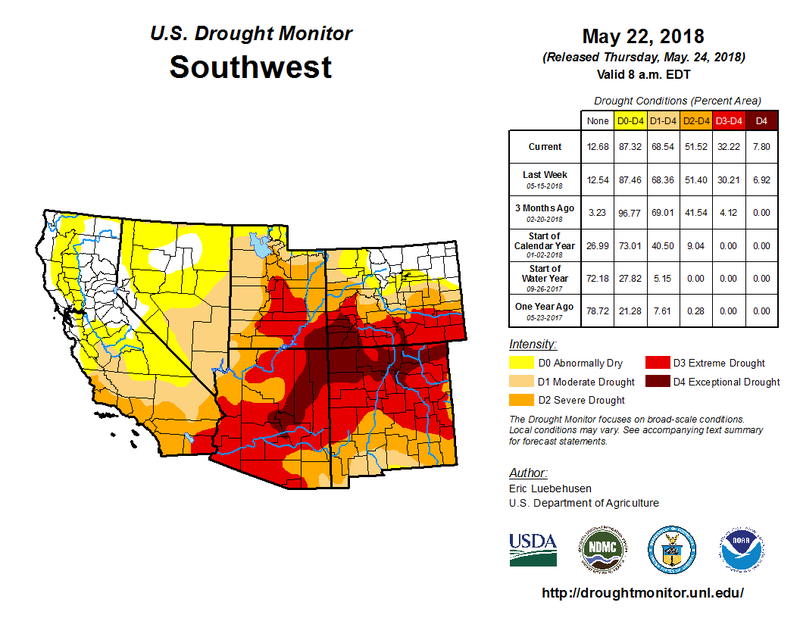 According to the U.S. Drought Monitor, more than 40 percent of Colorado, primarily the south and southwest, is in extreme or exceptional drought. Only the northern part of the state, served by the North Platte River, and northeastern Colorado, served by the South Platte, have so far been spared from drought. It’s a dramatic turn-around from a year ago at this time when only 6 percent of the state was in drought. It’s unusual to have a drought declaration this early in the year, according to Colorado Commissioner of Agriculture Don Brown. “Typically we will have enough moisture to get into growing season,” but that’s not happening this year, he told Colorado Politics. In those drought areas, winter wheat didn’t even come up this season. “It’s been bone-dry,” Brown said. Brown also pointed out that U.S. Secretary of Agriculture Sonny Perdue heard first-hand about Colorado’s drought problems when he toured the state two weeks ago.